This plugin will deactivate all in-game bags and create one HugeBag. It's as lots of features describe in the features section. Two mode are available, 'widget' and 'window'. 1- HugeBag will replace all your existing backpacks (support all 6 bags), so all methods of opening/closing the backpacks will open/close HugeBag. 2- HugeBag has a grid in the background. 3- Automatically saves his position when moved or resized. 5- 2 menu are available one by left clicking and the other by right clicking the 'Top Left' corner. 6- Can configure the hide HugeBag event when 'esc' key is press. 7- Can reset all settings back to default. 9- Can change the background color. 12- Can move all buttons to where you want. 14- Can change all buttons visibility. 16- Can see your all your alts vault. 17- Can see your shared storage. 18- Can use window/widget settings from your saved profile. 1- HugeBag widget will slide to the screen edge when hiding. 2- HugeBag widget will replace and resize himself according of your bags size. 3- HugeBag widget can be moved up and down (Hold Left Click on the 'Top Left' or 'Bottom Left' corner to move it. 5- HugeBag widget can be set to the left or right side of the screen. 6- Added option to show slots infos/HugeBag title/Nothing on top bar. 7- Added option to show slots infos/HugeBag image/Nothing on side bar. 1- Option to configure to see or not the free, used and max slots in the title. 2- Option to reset only the location and size settings to default. 3- Option to resize HugeBag from both bottom corner & from left, bottom & right border. 4- HugeBag position can be lock/unlock. 5- HugeBag size can be lock/unlock. 6- Option to show free or used slots in the tittle. 7- Option to show or hide HugeBag skin. 8- Can move and resize HugeBag w/o is skin. 10- Can change items orientation. You can either use universal or your language shell commands. - SAdd: Added ability to switch bottom button text from short to long. Thx dt192! 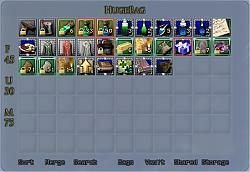 - Tweak: HugeBag will show correctly inventory slots up to 110. Thx Tommmo! - Tweak: The sorting function. Trying to get rid of the "You are too busy to do that right now" message. Thx dt192! - Cor: Background window now show correct Alpha value after it was changed and window reloaded. - Fix: The Black color theme in widget mode is now working properly. Thx BossXxX! 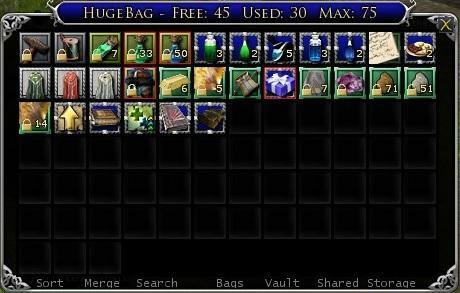 - Add: "Bags", "Vault" & "Shared Storage" now available directly on HugeBag. Thx Davinna! - Add: Ability to save/load settings from any characters. Thx Amethadan! - Add: 'Backpack', 'Vault', 'Shared Storage' & 'Load/Save profile' shell commands. - Change: The options menu layout a bit. - Change: The way settings are saved. To reduce time it take to save settings. No need to save all settings again when only one setting has changed. For the rest of the log changes see the "HugeBag.txt" file included in the zip file or click here. - To install simply unzip the file to your "Documents/The Lord of the Rings Online/Plugins" folder. - To upgrade, delete the 'HugeBag' directory and unzip the zip file to your "Documents/The Lord of the Rings Online/Plugins" folder. - If 'esc' is press just after an induction skill, the induction will be interupted! If you have found something that can make HugeBag better, I'd love to hear from you. You can submit your suggestions here. Try using the latest version first. Please include version and language. Providing error that appeared in the chat is a plus. See the "credits.txt" file included in the zip file. Thank you for supporting this project with your Download and Rating! Receive email notification on version updates by adding HugeBag to your Favorites. Before I go and uninstall/reinstall, I was hoping to hear if anyone else as having the same issue. Figured out it was putting bags 2-6 after the purchased extra bag slots, but looting to bags 1-6 first no matter what you do. So, you have to put all purchased slots in bag 6 in order and then move bags 2-6 in bag 1 in order. What a pain. Am I missing an easier way of doing this? When I loot items, they appear in my Hugebag out of order. i.e. it will loot to slot 1-21 in order, then any subsequent loot jumps to slot 91 onwards. I figured out how to fix it on main, but can't remember how. All new chars have the same problem. Any ideas? Thx, it worked great! Just put it at the end of the file. Could you make a Shortcut to the Players Wallet in the Bag Menu? I put the Code at the bottom and it worked just fine, didnt change anything. To get the default bags to not show you need to make a small change to the main.lua file. Put the following into the load function and change the index numbers to the object name. --write( L["HBLoad"] ); --HugeBag version by Habna loaded! I understand how to enter the text into the main.lua file, but what do you mean by "change the index numbers to the object name"? After editing the main.lua file, Hugebag could not load properly in game. Is this because i didn't "change the index numbers to the object name". How do i do that? Last edited by thewumpy : 01-25-2015 at 07:28 PM. Before I updated today to the newest Version, I used the workaround in the keyboard-preferences for not opening hugebaf and the first bag. This workaround did perfectly. After the update today hugebag and the first bag opens when I press "I". Is there any solution for only opening hugebag? 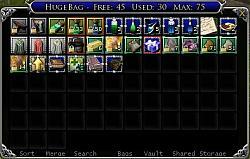 I just bought more bag slots and it rolled over to 115 slots. This made widget mode break. I thought I'd share my edit for anyone else. This Patch was already uploaded before, but it´s a bit difficult to find it in the text, while I couldn´t upload it as patch here. The problem after that was, that there are also some problems when using the window-mode, that are also fixed in my patch. But thanks for your correct suggestion. Last edited by burgus34 : 11-26-2014 at 02:17 AM. In the mainWidget.lua file, do a search for '110'. There will be two sections that need a slight mod to expand them to handle the increased storage. You should now be able to use up to the 120 slots with widget mode. Thanks for making this plugin! I still use it over the new bags. I hope they introduce the lock mode to LUA so you can add that too! - assign the key you want to use for inventory to "Bag 2"
Still looking into why the intended bugfix by Turbine does not work with HugeBag out of the box. As I am bothered by this myself I am right now looking into creating a patch.